Raise anchor and set sail for far shores and hidden hoards. Whatever destiny a traveller on the Sea of Thieves chooses to follow, it begins with exploration. This ever-changing ocean realm is rich in islands, each curled protectively around its secrets, and Outposts where hauls are cashed and tankards bashed with friends and strangers alike. When wanderlust can set in at any time, it's good to have options. If you have a communicative four-person crew, a full-sized Galleon offers the best balance of speed and defence. But an absent or indisposed crew shouldn't hold you back from exploring the seas when a smaller Sloop is also at hand, streamlined for just one or two sailors, or a sleek Brigantine for three. And don't forget to find a handy Rowboat to hitch to the back of your ship! Riches await you all across the Sea of Thieves, from The Shores of Plenty to The Devil's Roar. But the finest spoils aren't just found out in the open. Pinpointing hidden loot requires a map, a compass, good instincts and a generous disregard for danger. 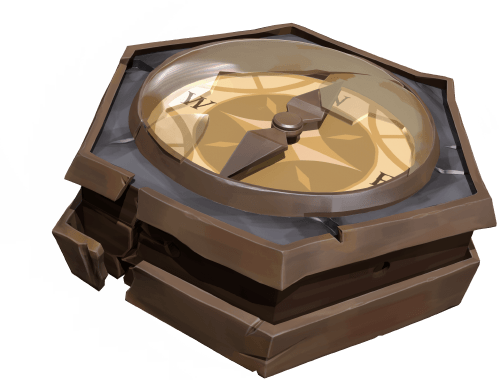 You can of course roam free with no fixed goals, but each treasure you track by map triggers a Voyage that could sweep you away to search for lost landmarks or tease out the truth from curious riddle clues. As you'd expect from a world that attracts fortune-seekers in such numbers, the Sea of Thieves sings with secrets and covert stashes. Venture off the beaten path in search of food and wood, precious relics, cannonballs (Cursed or otherwise) and wild animals to fill Merchant quotas. At sea, watch for seagulls flocking over sunken wrecks and you could recover beautiful, barnacled chests of gold that went down with their luckless owners. • Developer Gameplay: "Four Feathers"